Pr Roger Crumley is Chairman of the Department of Otolaryngology-Head & Neck Surgery at the University of California, Irvine. 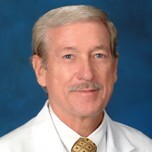 His research interests are Cosmetic facial surgery, Hoarseness, Nasal surgery, Sleep apnea & snoring, Vocal cord paralysis. He served as Director of the American Board of Otolaryngology, and President of the American Laryngological Association.